Bossiney Haven (Bossiney Cove) is a secluded picturesque cove, located just north of Tintagel. The Cove has an excellent beach at low tide and is generally a quiet "get away". Sat Nav Co-ordinates: N50º 40' 04.74" W4º 44' 11.07"
A small sheltered cove, with spetacular scenery. The north facing beach is sheltered by the surrounding cliffs. Access is via a steep ½ mile path from the car park. Unsuitable for pushchairs. At high states of the tide, There is no beach at Bossiney, but as the waters receded, they reveal a fine beach of golden sand which stretches from Bossiney Haven around the the headland to the neighbouring sands of Benoath Cove- accessible from Bossiney. There is parking adjacent to the main Tintagel / Boscastle road. 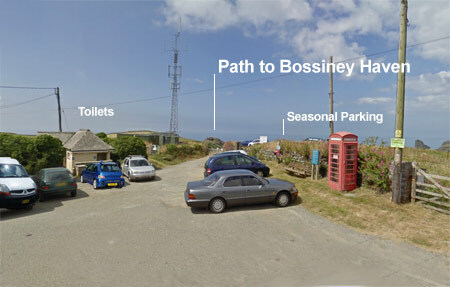 As you leave Tintagel, travelling towards Boscastle, you will pass the Ocean Cove Caravan Park (located on your left). Immediately after the Caravan Park, there is a small "pull in" adjacent to a small communications tower. The triangular shaped parking area will accommodate approximately 8 cars. During the holiday season, additional parking is available in an adjoining field. There are toilets next to the parking. 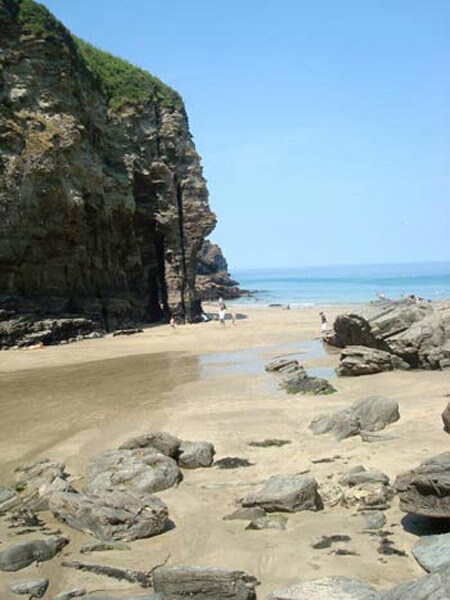 Bossiney is an ideal beach for swimming and snorkelling, with a reef along the western edge of the sands that provides a stunning marine environment that is well worth exploring. Bossiney is very much "off the beaten track" as far as holiday beaches go, but its proximity to Tintagel, makes it an ideal destination for a quiet day on the sands. The lack of Life guards and the steep descent to the beach, means that you must apply a degree of caution and common sense in terms of personal safety and this is not a beach that is advisable for very young children. 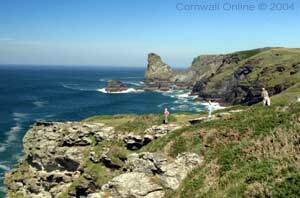 Bossiney cove is famous for the Cliff formation in the shape of an Elephant. Benoath Cove is more open than it neighbour, a small sandy beach that is revealed at low tide - located to the east of Bossiney Cove. The beach is accessible from Bossiney Cove at low tide (by following the sands around the headland) or via a very steep access path. The beach has no facilities. Dogs are allowed on the beach through out the year. Swimming is possible in calm conditions as the tide comes in. At other times care is needed as the area is prone to strong rip currents - especially at low or ebbing tides. The beach is a popular surfing spot with experienced surfers. An amazing rocky gorge that follows the course of a small stream, through a woodland environment down to the coast, where you are greeted with stunning coastal vistas across Benoath Cove towards Bossiney and Willa Park. The walk through the valley is classified as moderate, covering a distance of approx. 1.4 km from the lay-by to the coastal path. Rocky Valley is a easily located, as you leave Tintagel on the road towards Boscastle, once you have passed Bossiney, the road drops down a steep hill. On the left had side of the main road you will see "Trevillet Mill" - The Restaurant is the main access to Rocky Valley from the road. You can park at the lay-by ( grid ref: SX073891) on the side of the main road and follow the "private road "down towards the restaurant - there is it is a public footpath through the property that leads to Rocky valley - which is clearly marked when you get to the bottom of the road. When you get to the Restaurant, the footpath takes you across a small bridge opposite the main building. The path then follows the Trevillet river down through the woods to a small gorge on the coast. Approximately half way along the path, you come across the ruins of the old Trewethet Mill. The water mill is now just a ruin, but there are "Cup and Ring" markings carved into the rock face behind the the mill. A plaque marks their location - the markings are controversial as some historians believe that the labyrinthine stone carvings could date from the Bronze Age, whilst a growing number believe that it was the work of one of the Millers, therefore much more recent in historical terms. At Trewethet Mill the path cross the stream and from here to the rocky gorge at the end of the waters journey, you follow the Western Bank. There are many small waterfalls along the route, where you can watch Dippers catching invertebrates in the fast flowing waters. Rocky Valley has a small resident population of Dippers and Gray Wagtails, both easily spotted along the stream by the ruined mill. The valley supports a varied flora and fauna, with an environmental important collection of Moss and liverwort species in the more humid woodland sections of the valley. This walk is best done when the weather is dry, as the paths become very "muddy". The seaward leg of the footpath through the valley is more open. The environment changes to a drier, maritime grassland vegetation, with clumps of pink "thrift" appearing between the rocks, as the path rising up the western edge of the gorge to meet the coastal path. The views here are quite spectacular.